Last Friday, I was fortunate to be included in a panel discussion on “real-time marketing” hosted by MediaPost as part of their Brand Marketing Summit. The summit took place in Kohler, Wisconsin (just south of Green Bay) and the day involved me driving in relentless, pouring rain for four hours—but I’ll save the road trip highlights for another blog. The question posed to the panel last week was “do brands need to be operating in real-time?” and the simple answer, of course, is yes —consumers are no longer as willing to participate in a dialogue that has been manufactured, vetted and scheduled for launch by a brand, for a brand. Instead, consumers are giving brands credit for engaging in conversations and events that they have started themselves. That word “human” is key to the whole thing, and there was much conversation on Friday about the growing need for brands to show their human side in order to be accepted in a real-time, social media forum. Of course, brands have always aspired to come off as more human, but the advent and subsequent explosion of social media channels has now created an environment that actively, hourly challenges brands to put their money where their Twitter accounts are. Also, if brands want to show their more human side—and do so in a social media / real- time way—they must be willing to empower somebody at the top of their organization to create and approve ideas fast. This brave and bold attitude is what allowed Taco Bell President Greg Creed to take out a full-page ad in both the Wall Street Journal and USA Today with the headline “Thank You For Suing Us”—in response to a lawsuit that challenged the brand’s beef recipe. 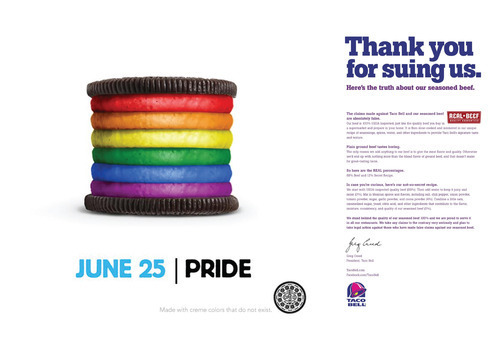 And it’s the same attitude that gave Oreo the confidence to run a Gay Pride Celebration ad as part of their Daily Twist campaign of 2012. You have to be a “human” brand to have the conviction of purpose and clarity of voice to make these types of “real- time” calls.